I’ve always suspected that the link between economic development and fertility is more complicated than the standard story of inverse relationship. Increased economic opportunities increase the opportunity costs of having children, and this decrease fertility. Counterbalancing this, though, is the possibility that kids are a normal good in the sense that demand increases with income: as we get richer, we are more willing to give up income to have kids. Additionally, advances in IT seem to be pushing down the opportunity cost of children by making flexible work arrangements (particularly telecommuting) more feasible. It’s possible that at some point the pro-natal factors could come to dominate the anti-natal. According to some new research published in Nature, there does seem to be a development threshold above which the standard relationship is reversed [WaPo story, gated nature article, annoying ungated version]. The results indicate that the standard story remains true for most countries, but once countries reach a very high level of development – around 0.85-0.9 on the Human Development Index – fertility begins to increase. 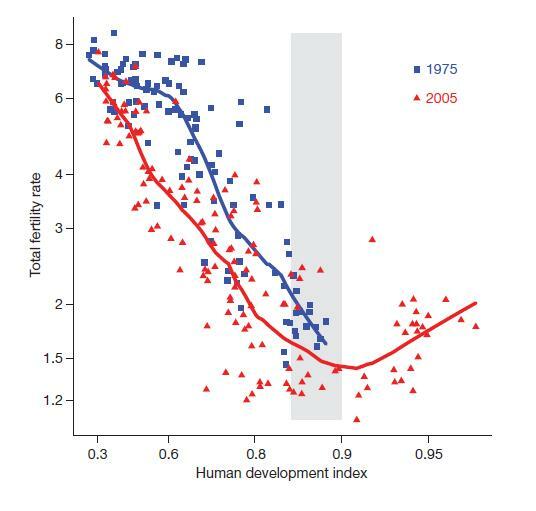 If this trend is real and continues to higher levels of development, the long-term relationship between development and fertility should be U-shaped (or maybe even J-shaped!). As someone who likes people and would like to see as many of them as possible, I think this is great news. The Simonian future of a trillion humans might not be quite so far off, after all. Neoclassical welfare economics takes an outcome-oriented approach that uses Pareto optimality as its benchmark for welfare maximization. When one looks at the remarkable improvements in economic welfare that have characterized market economies, most of those improvements in welfare have been due to economic progress that has introduced new and improved goods and services into the economy, and innovations in production methods that have brought costs down, leading to higher real incomes. Pareto optimality is only peripherally related to actual economic welfare, and no economist would argue that people are materially better off today than a century ago because the economy is closer to Pareto optimality. After analyzing the actual factors that lead to improvements in welfare, this paper suggests a reformulation of the foundations of welfare economics to replace the almost irrelevant outcome-oriented concept of Pareto optimality as the benchmark for evaluating welfare with a process-oriented benchmark based on factors that generate economic progress. The paper then explores some implications of this reformulation. This video from 1981 (hat tip: Jerry Brito) shows the remarkable progress of information technology in recent years. That which which seemed amazing yesterday is taken for granted today. Hyperland (1990) from Douglas Adams is even more remarkable in how exciting it made hypertext seem. If we think back even further, someone 300 years ago would find the way we live today – or even the way we did in 1981 – absolutely unimaginable. Talking to someone on the other side of the world through some strange contraption? Witchcraft! This is why we shouldn’t discount future technological innovations – indefinite lifespans, bioengineered superintelligence, desktop nanotech – based on their pure strangeness and unfamiliarity. We are in the midst of self-reinforcing and accelerating economic growth. Decent institutional arrangements have allowed markets and other means of technological innovation to produce new knowledge at an unprecedented rate. Knowledge begets more knowledge, as we use past innovations to more effectively produce new ones. This sort of growth is not the norm if we consider human history as a whole, and it’s possible that an exogenous shock could force us out of our positive feedback loop. I wouldn’t bet on that happening, and think those in the near future will have levels of wealth and capabilities only the most imaginative of us can dream of today. We tend not to notice change as it’s happening, but its cumulative effect is enormous. The Singularity will come, but nobody will notice it. The Alliance Party says the Government should take ownership of the Lane Walker Rudkin (LWR) Factory in Christchurch to prevent a disastrous loss of hundreds of jobs. Alliance Economic Development Spokesperson Quentin Findlay says it is vital that jobs and incomes are preserved to prevent mass unemployment in New Zealand. He says the Government should take control of failing enterprises and investigate options such as public ownership, employee shareholdings and worker ownership. Mr Findlay says the cause of the LWR factory’s closure was both National and Labour led Governments supporting free trade deals and free market policies. It’s hard to believe these morons won 13 seats in the New Zealand’s parliament in the 1996 election. I understand calls to compensate those who lose out from economic change (I know some very smart and reasonable lefties), but it is just beyond me how anyone could be so short-sighted as to think that businesses which do not produce anything of value should be kept afloat. Whenever someone proposes this sort of thing I generally ask them whether they would think it a good thing if ninety percent of people still worked in agriculture and had pre-industrial levels of wealth. I’ve never heard to reasonable argument for the idea that past, but not future, economic growth was worth the short-term costs of dislocation. There are some primitivists, of course, but they’re certainly a minority of anti-current progress types. I suspect a big part of it is the status quo bias. Update: Paul Walker offers a very thorough and wide-ranging takedown of Alliance’s stupidity.